Gift a sentiment to a truly special pair in your life that is guaranteed to be received with a loving smile with this touching, hanging porcelain heart from the makers at East Of India. A subtle decoration but a very touching sentiment, this hanging heart is made from a shining porcelain material, creating a light rippled effect over its surface. 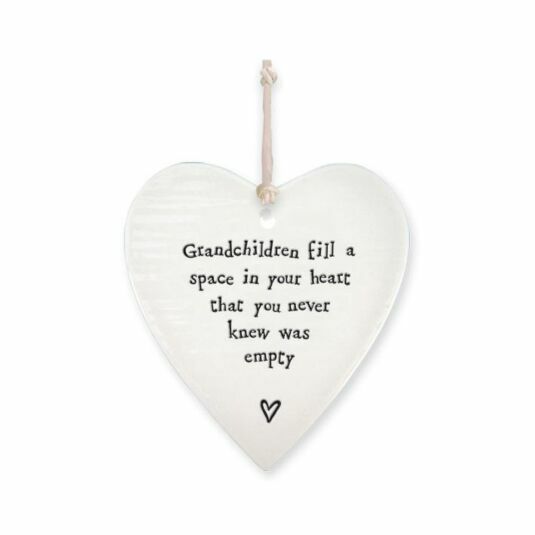 Subtle in terms of its design, it features the quoted words “Grandchildren fill a space in your heart that you never know was empty” in a debossed black quirky font complete with a miniature illustration of an outlined heart below. This sentimental heart decoration can be easily displayed or hung through the inclusion of a light coloured piece of twine. 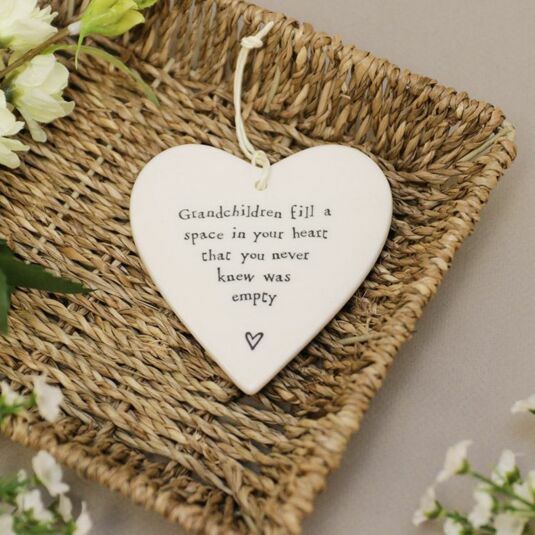 Show a grandmother and grandfather how much they truly mean to you, and in turn how much you love them with this touching porcelain decoration, perfect to gift to a loved one close to your heart. Ideal for gifting at Christmas time, on a birthday or as a ‘just because’ gift.